Around the turn of the century, shortly after the development of the chain-driven bicycle, someone came up with the bright idea of elliptical chainwheels. The idea was that the large radius of the chainwheel would drive the chain when the cranks are horizontal and the small radius would pull the chain when the cranks are vertical. The theory was that while the cranks are horizontal you can pedal more efficiently, and thus can push a higher gear. When the cranks are vertical, you get a lower gear due to the smaller effective radius of the chainwheel. The lower gear is easier to push, and you get through the dead spot sooner. This looks great on paper, but doesn't work out so well in practice. Durham Camel -- image courtesy of Speedplay. The major problem is that this design tends to hurt people's knees. The high gear when the cranks are horizontal encourages the rider to push too hard, and we all know that pushing too high a gear is a common cause of knee problems. In addition, the low gear when the cranks are vertical means that the knees are moving extra fast when they are changing direction from going up to down and vice versa. This "whiplash" effect caused most users to abandon elliptical chainwheels. Ever since the chain driven bicycle was invented, elliptical chainwheels have been re-invented and re-abandoned for the same reason every ten or fifteen years. Biopace is a patented non-round chainwheel design made and licensed by Shimano. To a casual glance, Biopace chainwheels resemble elliptical chainwheels, but on closer examination they turn out to be the opposite of the classical elliptical design. The product of extensive research and computer-aided design, Biopace chainwheels have the small radius engaged when the cranks are horizontal, the large when they are vertical. This is because the Biopace design is based on a dynamic analysis of the motion and momentum of moving cranks and legs, unlike the static, geometric analysis that produced classical ellipticals. The theory is that during the power stroke, when the cranks are more or less horizontal, you are using the power of your legs to accelerate your feet, which get going quite fast in the lower gear provided for that part of the stroke. The momentum of your feet then carries the pedals through the "dead spot" when the cranks are near vertical. Since the rider doesn't push as hard during the power phase of the stroke, and motion is slower when the leg is changing direction, the Biopace design is gentler on the knees than even round chainwheels. The image above shows 48-38-28 Biopace chainrings on a triple crankset. Note that the smallest diameter is at a right angle to the crank, so the crank turns fastest when horizontal -- in the middle of the power stroke. Biopace chainwheels are particularly suitable for touring cyclists and time trialists, or any application that involves a steady, fairly constant cadence. They allow healthy, efficient pedaling at slower cadences than is possible with round chainwheels. They are especially suitable for triathletes and mountain bikers. The triathlete benefits because the motion is a little bit closer to that of running, making the transition easier. The mountain biker particularly benefits, because the Biopace design somewhat smooths out the delivery of power to the rear wheel. In climbing on loose surfaces, the limiting factor is often traction. The rear wheel tends to break loose during the maximum power phase of the pedal stroke, wasting most of the cyclist's energy. The Biopace chainwheel works like a storage device, storing power during the main power phase of the stroke as the feet accelerate, then delivering the stored power to the rear wheel during the "dead center" phase when the cranks are nearly vertical. The same average amount of power is delivered to the rear wheel, but in a smoother, less pulsating flow. The bicycle moves at a more even speed. All the energy is used to propel the bike forward, without the high-power peaks' spinning the rear tire or causing the bike to "wheelie." The marketers of Biopace made a crucial error of judgment: too much information. In particular, they mentioned that the Biopace design was optimized for cadences of about 90 rpm and slower. Many readers interpreted this as an indication that Biopace chainrings would somehow interfere with pedaling faster than that. This perception caused a bit of a self-fulfilling prophecy, and the Conventional Wisdom arose that Biopace was bad for high-performance cyclists for this reason. I [Sheldon] used to believe this myself, but I rode them anyway because I appreciated their other virtues. 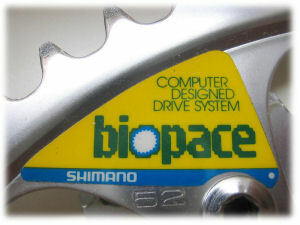 In 1989, Shimano introduced a new variant, Biopace HP (High Performance), more nearly round than standard Biopace. This was marketed to cyclists who race in packs and use clipless pedals, but did not overturn the marketing problem. Among other bikes, I run Biopace on several of my fixed-gear machines, where high cadences are quite common in descending hills. In practice I have found no less ability to spin fast with Biopace chainrings, and, if anything, they permit me to spin faster without bouncing in the saddle. The slower motion at top and bottom means that your leg changes direction from upward to downward, or downward to upward motion at a slightly slower, more gentle speed. The increased leg speed near the middle of the stroke is the result of a more gradual acceleration/deceleration with the leg moving in the same direction. Bouncing in the saddle generally results from difficulty with changes in leg direction, not speed in the middle of the stroke. Thus, as Biopace makes it easier on your knees, it also can help you spin faster without bouncing! Cranksets of Sheldon's all-Biopace Piccio fixed-gear tandem. Both sets of cranks have the same motion, controlled by the main drive chainwheel. The matched Biopace chainwheels on the synchronizing chain have no effect. People are often astonished to learn that I ride Biopace chainrings on fixed-gear bikes. They imagine that there will be tremendous changes in chain slack as the chainring rotates. In practice, this is not the case. A 42 tooth chainring will generally engage 21 teeth against 21 chain rollers, regardless of its shape. There is a slight variation in tension resulting from the varying angle between the two straight runs of chain as the axis of the chainring rotates, but this has not generally been of a sufficient magnitude to cause any problem in practice for me. Biopace chainrings are no longer made, but they are found on many bicycles from the 1980s and early 1990s. Biopace chainrings turn up in substantial numbers on eBay. 50T, 48T, 46T, 44T, 38T and 36T chainrings were made in the 110mm bolt circle diameter; 28T and 26T chainwheels in the 74mm bolt circle diameter. 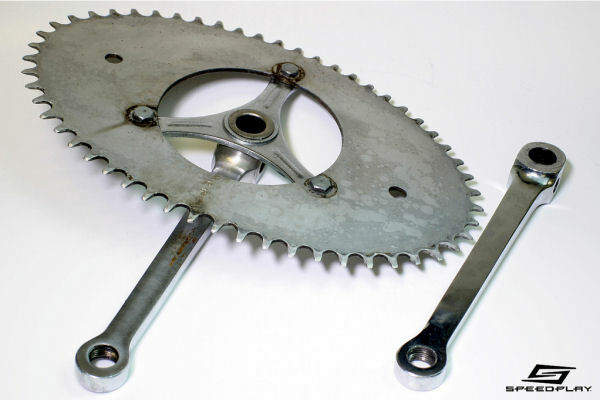 These chainrings were generally used in triple cranksets: the 74mm bolt circle is only used for the innermost chainring of a triple. However, the outer chainring may be left off or replaced with a chainguard/protector plate (like a toothless chainwheel) for a wide-step double. Sizes 53, 52T, 42T and 40T (that one only in steel) were made in the 130mm bolt circle and were generally used in racing doubles, though some cranksets have a 130mm outer and 74mm inner bolt circle. 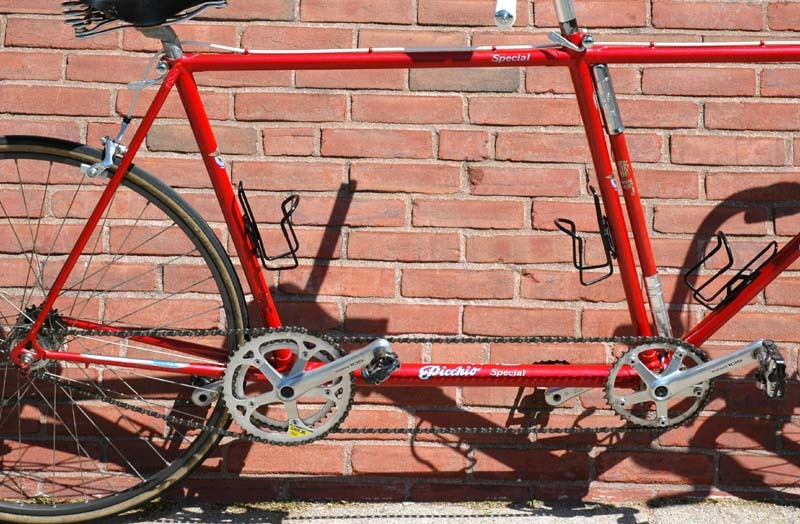 Few front derailers could handle a 52T outer and 28T inner Biopace chainwheel, though. The usual stock combinations with Biopace chainrings were 48-38-28 or 46-36-26 for a wide-step triple; 52-42 for a racing double. A half-step-plus-grannies combination is possible with 50T-46T or 48T-44T for the two outer chainwheels and a 28T or 26T inner chainwheel. This works well with an 11-13-16-19-23-28-34 cassette -- a custom combination, to be sure. A "triple" front derailer must be used with the wide-step combinations and a "double" front derailer, with the half-step combinations. 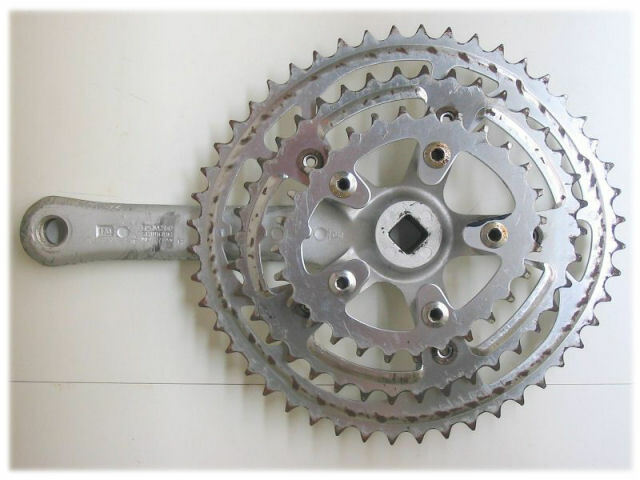 Because of the varying diameter of the chainrings, the front derailer must have about 4 teeth more chainring capacity than for round chainrings, and should be specified for a large chainring two teeth larger than the number of teeth on the large Biopace chainring. Biopace chainrings and cranksets were made for 7-speed and 8-speed systems, but will work with 9-speed chain. For installing Biopace chainrings, the orientation should generally be preserved. Each Biopace chainring has an "indexing mark." This is a small tab pointing inward toward the middle of the chainring. For a normal upright bicycle, this index tab should be hidden behind the right crank. In a custom installation, using an adapter ring, the index tab may be directly opposite the crank. For recumbents, the chainring should be rotated forward by 1 bolt position. It is possible to mix Biopace and round chainwheels on the same crankset, but I [Sheldon] would not recommend it. When chainwheels are mixed, it is usually a small Biopace with a large round ring. The idea is to take advantage of the Biopace's superior climbing performance at low RPM's, and have the big round ring for descending and spinning fast. The problem is that Biopace rings are more comfortable at low RPM's, and round rings at high RPM's. When you shift from a small Biopace ring to larger round ring, you go from a fast cadence on the Biopace to a slower cadence on the round ring--just the opposite of what is wanted. I have tried this arrangement on both a road bike and a mountain bike, and found it extremely irritating. Due to the need to work well with a front derailer, the large Biopace rings have less "Biopace effect" in any case: the variation in diameter the same, but this is a smaller percentage of the total diameter. Large Biopace/small round makes even less sense. If you like the large Biopace, you will like a small one too. The only reason I can think of for setting up a bike this way is if you need a lower low gear than you can get with Biopace. For instance, the smallest Biopace for the 74 mm bolt circle is a 26, but you can get a 24 tooth round ring in that size. For the 110 mm bolt circle the limit is 36 teeth Biopace vs. 33 teeth round; for the 130 mm bolt circle, 40 teeth Biopace, 38 teeth round. You can usually lower the bottom gear by installing a larger rear sprocket instead. I [John Allen] bought a Bike Friday travel bike at the factory in Eugene, Oregon in September, 2005. At Portland International Airport, the TSA's x-ray machine ejected the bicycle in its carrying case like a baseball from a pitching machine, to smash into into a rigid barrier at the bottom of a chute. When I unpacked the bike at home, the chainwheel was bent. I replaced it with a Biopace chainwheel I had on hand. In early 2006, I attended a winter training camp in Arizona run by legendary transcontinental record-setting cyclists Lon Haldeman and Susan Notorangelo. For a very short time on one of the rides, Lon was drafting behind me. Really! Mostly, he hung in there so he could exclaim about my bicycle. "You're riding Biopace!" I replied apologetically, "it works OK for me, and it's what I had in my parts stash." Lon replied, "Pete Penseyres and I did our transcontinental tandem ride in 1987 with all Biopace." A couple of years ago, I added a 28-tooth Biopace chainring, using the previously unoccupied 74-mm bolt circle of the Bike Friday's crankset. I haven't contrived a front derailer yet to work with the Bike Friday's unusual frame, so I have to shift the chain manually. That's OK because, thanks to the bicycle's small wheels, I only need to use the 28T chainring for very steep, long climbs. It has taken me to the summit of Mt. Wachusett, here in Massachusetts, at age 65, without walking, spinning all the way! [Sheldon here.] Biopace chainwheels were made by Shimano and were also made under license by some other manufacturers. The shape of genuine Biopace chainwheels is not a simple ellipse, but a more complicated shape which Shimano described as a "point-symmetric egg curve." Other crankset makers have made similar designs, generally of simpler shape (pure elliptical) but oriented in a similar manner to Biopace chainwheels. Examples are SR's "Ovaltech" and Sugino's "Cycloid." Non-round chainwheels remain controversial, especially among racers who think that everyone should ride racing bikes, but, in my opinion, they are of real value for the vast majority of non-racing cyclists.